Now that A-‘s umbilical cord stump has fallen off and things have settled down a little, it’s time to figure out the next step in my curriculum for surviving life with a newborn: cloth diapering. 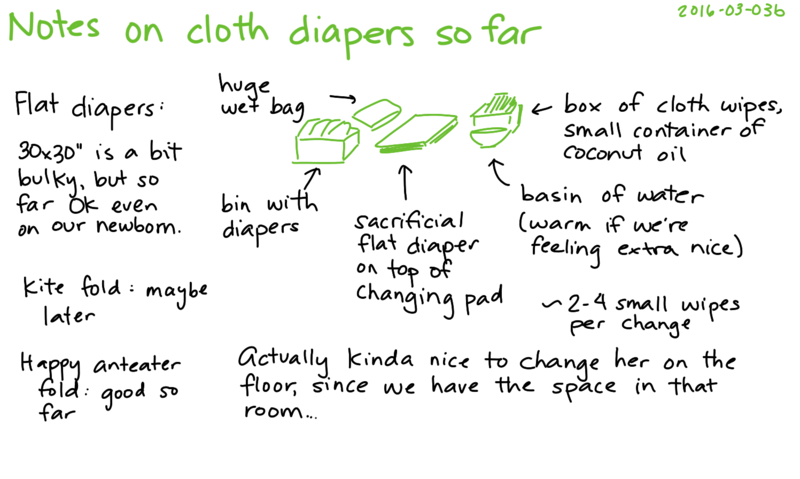 We’ve been thinking of going with cloth diapering as a way to reduce waste, save money, and have more flexibility, with disposable diapers for overnights or trips out. Over the course of several months, I had raided thrift stores for flannel sheets (two queen sheets at $6.99 each, one twin sheet at $5.99) to cut up into roughly 30″x30″ squares. I converted the remnants of the sheets into stacks of reusable wipes. I also picked up a number of flour sack towels. For comparison, I ordered some diaper flannel from the Internet. It’s a little denser and less nubby than the flannel sheets I picked up from thrift stores. Looks like the thrift store flannels are doing fine, though. I washed everything on hot to sanitize and shrink them before cutting the diapers, so the flats are actually mostly square. I sewed some one-size covers from the 1mil 72″ white PUL I ordered from Wazoodle, following the Little Green Bear tuckable diaper cover pattern. The midwives also passed along some cloth diapering supplies donated by other families: small gPants and inserts, a couple of covers, and a stack of cotton prefolds. A- seems to be too big for the gPants. (Already?! She’s less than two weeks old! Maybe I’m not putting them on correctly… I’ll give them a try again before we wash and return them to the midwives.) As it turns out, I was putting the gPants on backwards. They fit, yay! We haven’t tried the prefolds yet. We were a little worried about potentially poking her or us with safety pins, but it’s actually pretty manageable. I sharpened the pins on a whetstone, and we use a little coconut oil to lubricate it as well. Some of the flat diapers are more tightly-woven than others and require a bit more pressure, but keeping a hand between the diaper and her skin helps me feel more confident about pinning. The kite fold we started out with was a bit bulky in terms of both pinning and lying down. The happy anteater fold that W- found seems to be working wonderfully. There’s less fabric in the back, and it’s easy to pin in front – we’ve been getting by with one pin! I might still order those fancy diaper pins with locking heads when she’s more mobile and more curious, but in the meantime, things are working fine. Laundry-wise, we’ve been doing a small load daily. It was a little ridiculous when it was just wipes, pads, baby clothes, but now that the diapers are in the rotation, it feels like less of a waste. Clothespins are great for increasing our effective line-drying density, especially for the small wipes. On a related note, it looks like knits are definitely the way to go for baby clothes, I think. She didn’t fit at all into the newborn kimono top I made (sleeves too small! ), although some of the larger ones might still be okay. Now that she’s here, I can make things based on her proportions. (Well, eventually, when she’s less of a barnacle. =) ) Good thing I mostly focused on size-independent accessories such as wet bags and wipes!